This year’s competition for the Muay Thai King’s Cup at Sanam Luang in Bangkok began with an EFN Champions League Sweet Sixteen that worked its way through four 4-man tournaments in the 70 kg (154 lbs.) division down to a Final Four on December the 5th in honor of the King of Thailand’s birthday. 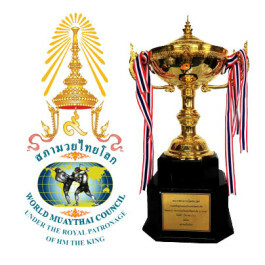 Sanctioned by the World Muaythai Council (WMC), the annual command performance for His Royal Majesty has made it the most prestigious event on Muay Thai’s calendar. Going into the Final Four were winners from two qualifiers in Bangkok plus a double-header in Malaysia. The qualification series marked a return to the traditional method of selecting the finalists. It was organized by Elite Boxing under the EFN Champions League brand. King’s Cup 2015 also saw the debut of a new competition format, which was introduced by WMC Executive Board member General Tanwacom Tippayachan. Instead of fighting the usual 5 three minute rounds (5×3), competitors had only 1 sudden death round in each of the two eliminations to smoke or choke. The title bout went 3 rounds. Do the math and the finalists fought 5 rounds overall but spread over three fights. Over 30 million viewers worldwide tuned into the Final Four. It kicked off with a semi-final fight between Sean Sor. Sumalee and Changpuek Kiatsongrit. This turned out to be a real crowd pleaser. Changpuek took a point decision. He advanced to the final, while Sean Sor. Sumalee got a standing ovation for his gutsy performance. Peru’s Gabriel Mazzetti made it into the other semi-final on a walkover, after an injury forced Chok Eminenair to pull out. The South American champion beat Suweilek from Malaysia, earning him a place in the title bout against Thai contender Changpuek Kiatsongrit. Their battle for the King’s Cup gave no cause for pause. They sucked the oxygen out of each other’s breathing space. When the score cards all were tallied, it was Thailand’s Chanpuek lifting up this most prestigious of all Muay Thai trophies. Not only did Changpuek Muaythai Academy win the inaugural EFN Champions League tournament in Bangkok, he was also awarded 150,000 THB ($4,175 USD) in prize money. The tournament’s most meaningful scorecard, far and away, tallied how many sovereign nations were in the competition, with so many more aspiring to a berth. Reaching across the globe and back to the future, Muay Thai scored a spiritual win for the proposition that respect honors those who practice it. This entry was posted in News & Results and tagged Bangkok, Changpuek Kiatsongrit, Chok Eminenair, EFN Champions League King's Cup, Elite Boxing, featured, Gabriel Mazzetti, main featured, Most Featured, Muay Thai, Muay Thai King's Cup 2015, Sean Sor. Sumalee, Suweilek, thailand, WMC. Bookmark the permalink.